Implementation of a recursive forward position kinematics algorithm to calculate the position transformation from joint space to Cartesian space of a general kinematic chain (KDL::Chain). Definition at line 36 of file chainfksolverpos_recursive.hpp. Definition at line 28 of file chainfksolverpos_recursive.cpp. 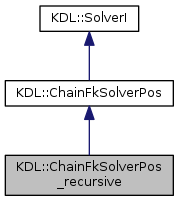 Definition at line 95 of file chainfksolverpos_recursive.cpp. Calculate forward position kinematics for a KDL::Chain, from joint coordinates to cartesian pose. Definition at line 33 of file chainfksolverpos_recursive.cpp. Definition at line 59 of file chainfksolverpos_recursive.cpp. Definition at line 45 of file chainfksolverpos_recursive.hpp.